The full service facility offers an outdoor ring (135x270) with sand footing and lights, dressage ring, indoor ring with great lighting (sand/fiber footing), cross country jumps, large fields with run-in sheds for turnout as well as private and semi-private paddocks. The center aisle way barn offers large stalls with mats, hot/cold wash stall, farriers station, large tack rooms, ample grooming areas, great lighting, access to trails, free trailer parking as well as a heated/ac lounge with shower. 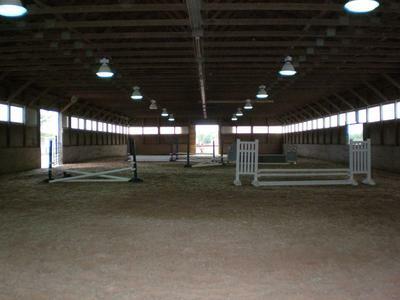 All stalls open to the large center aisle way and have front sliding doors. The rear wall of the stalls have dutch doors which allow horses to look outside during nice weather. Our barn staff is on site 24/7 and provides night checks. Horses are fed twice daily with supplements added at no additional charge. We offer unlimited hay in the stalls. Round bales provided outside in the winter months. Our facility offers safe fencing. Blanketing, fly masks and fly spray done daily at no additional charge. Stall board available for $700 per month. Pony stall board starts at $600 per month. The indoor ring is a mixture of sand and fiber . The footing is treated regularly to maintain a dust free environment. Lovely footing with great lights! Our outdoor ring consists of sand footing and pvc jumps. The rings lights are "stadium" style which provides ample brightness.